A jewel of theatrical architecture preserved since the 17th century. Its history begins when, in 1601, the carpenter Francisco Sánchez built, on behalf of the City Council of Alcalá, a courtyard or corral of comedies in what was then called Plaza del Mercado, now known as Plaza de Cervantes. He began his life as a theater in 1602. From that time, in addition to the original structure of the building (of rectangular shape), important elements such as the stage, the pit, bleachers, the boulder floor, the well, two rooms are conserved or the space that occupied the popular “cazuela”. In the eighteenth century, it was transformed, adding a roof to four waters, in the Colosseum, and in the nineteenth it adapted to the tastes of the romantic theater, with boxes, giving it an elliptical shape. Finally, in the twentieth century a projection screen was installed to convert it into a cinema, and as such it maintained its existence until the 70s of that century. A unique building in Europe, which today continues to fulfill the function for which it was created: to be a theater. A patio or corral of comedies is a theater located in the inner courtyard of a block of houses. 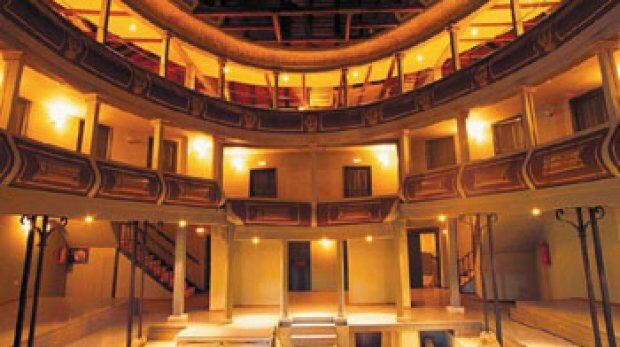 Its origins date back to the end of the 16th century and were fundamental to the success achieved by Spanish theater in the Golden Age. During this historical period, all profane plays were called “comedies”, although, in fact, the term referred to three genres: tragedy, drama, and comedy itself. Prior to the sixteenth century, there were no stable theaters in Spain. The performances were held in courtyards of houses or inns that were rented for this purpose. The companies mounted an improvised stage at the end of the patio and reserved the upper galleries for the more affluent classes. The rest of the spectators saw the show standing, standing in the open-air courtyard. From the sixteenth century, they begin to build stable theaters that repeat the typology of the previous ones. They are structured around a closed, rectangular and uncovered patio, inside a block of houses. It was located at one end of the patio, against the wall of the house at the back. It was removable in its beginnings, but then became fixed. The original balconies were used as part of the stage (appearance balconies). The women’s dressing rooms used to be behind the scenes. It was placed under the stage and served, among other things, as a dressing room for men. Located in front of the stage, it was the place since the men, also called musketeers, attended the show standing up. On the sides, there were a series of stands, from which men could also attend the performance sitting on benches that could be rented. Both the stage and the side steps were protected by a cantilevered roof. A cloth awning allowed roofing the corral to protect the public from the sun. Rooms facing the courtyard through the balconies and windows of the houses that surrounded the theater. They were places reserved for noble people, whether men or women. It was the place where women of the lowest class were located. He was facing the stage and he used to have stands where they could sit. A space that is documented in the Madrid theaters, was on top of the casserole. From them, they attended council representations and other local authorities. In this place were the attics, very small rooms where the gathering of the religious was located and a second casserole. They sold wafers, wafers and a drink called “aloja” (water, honey and cinnamon). It was forbidden to sell alcohol, but it was common to mix the house with wine. There used to be no more than three and they performed on one side of the stage on a small stage. The first regulation of public order for these theaters was dictated by the Royal Council of Castile for the corrals of Barcelona, then extended to the rest of the kingdom. In addition to the sheriff, there were figures such as the squeeze, in charge of pushing or squeezing to their seats those who had paid. Another figure, also responsible for keeping everything in relative calm, was the so-called maintainer of order. The theatrical season used to start on Easter Sunday and end on Ash Wednesday. Between the months of October and April, the comedy began at two in the afternoon. Starting in the spring, at three o’clock and in the summer at four o’clock. The idea is to finish before sunset. The performance lasted between four and six hours. The men and women were separated. The men were placed in the patio (benches, side steps and standing). The women attended the performance from the “cazuela” stand. The only place where men and women could be together was in the rooms located in the corridors of the courtyard. Different entrances were paid: one at the entrance, another for the brotherhood, brotherhood or beneficiary and another to sit down. The benefit of the company of actors did not usually reach 20% of the proceeds. The university cities such as Alcalá de Henares had a special norm that prohibited to represent during the week. The reason was not to distract the students in their obligations. At first there were no sets. Later, decorations and other scenic resources would be used. Comedies did not last long: eight or ten days was already a success. Entry to children was prohibited. The comedians were of very different condition. There were up to eight types of companies, from the famous bululú (a single actor) to the well-organized show business or company (16 actors and 50 works). The life of the actors was hard and was not very well seen. The customs of the comedians were the subject of much criticism. But, despite the efforts of some moralists and different real prohibitions, the theater remained one of the most important passions of the Spanish society of the Golden Age.